Compared to a decade ago, one of the things you immediately notice that has changed about personal computers is their design. Long gone are the ugly beige boxes, with accompanying unattractive CRT displays and peripherals. These days companies are paying much more attention to design, and in this review I'm taking a closer look at the premium Illuminated Keyboard from Logitech. 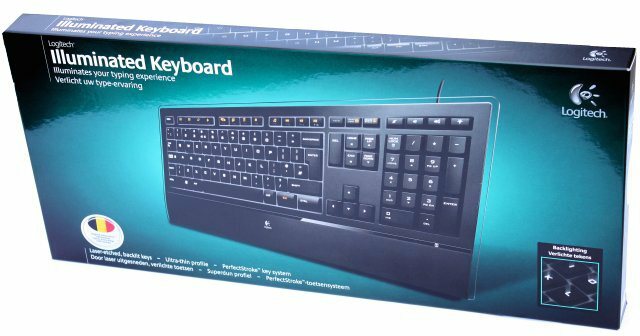 At 79.99EUR the Logitech Illiminated Keyboard wasn't designed for the average Joe, but for the people who don't mind shelving out more money to get attractive hardware. Contrary to most expensive keyboards on the market, the Illuminated Keyboard wasn't designed for gamers but for everyday use. There are very little bells and whistles on this keyboard, it has a very minimalistic design and a frame that's just 9.3mm thick. Here's a first look at the Logitech Illuminated Keyboard, the keyboard I tested has a Belgian Azerty layout but obviously it's also available in other keyboard layouts. The keyboard measures about 455mm x 190mm and is 9.3mm thin. It has a black design with translucent borders, and a large palm rest. Besides the keyboard the box also contained a quick-start guide and a CD with the drivers. Type easily—even in the dark. Bright, laser-etched, backlighted keys: Provide precise illumination that can be adjusted to suit your needs. Only the characters are illuminated, so you get just the right amount of light. Ultra-thin, 9.3 mm profile and transparent frame: Make a bold statement and add an elegant touch to any desk. Sleek, minimalist design: The ideal combination of form and function, the Logitech Illuminated Keyboard gives you exactly what you need from a keyboard. PerfectStroke™ key system: Gives you more key travel than typical notebook keyboards. Research shows that a longer distance required for each keystroke (key travel) improves your typing experience. Every stroke is comfortable, fluid, and silent. Tested for up to 10 million keystrokes. Soft-touch palm rest and full-size key layout: Make your typing experience more comfortable—even after extended use. One-touch multimedia controls: Includes volume controls for music and video. Enjoy instant access to your favorite applications, including your media player, e-mail, browser, and more. The nonslip palm rest feels soft and has a small Logitech logo in the center. Many keyboards have a removable palm rest, but that's not the case with the Logitech Illuminated. I know that some people dislike palm rests, but personally I like it this way because removable palm rests usually cause a lot of hassle. On the last couple of keyboards I've owned the flimsy removable palm rests always tended to detach themselves from the keyboard when I moved it.